Friends of Fresh Pond Reservation bird walks end at the Maynard Ecology Center in the basement of Neville Place Assisted Living Facility. Over refreshments and coffee or tea we tally our sightings as a way of helping people remember what birds we saw. This list is posted on Mass Audubon Society's eBird website and the Friends group website. 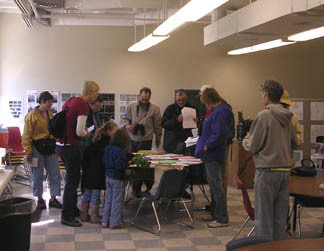 Here participants are collecting sheets of information printed by the Friends.